Create iPhone ringtones now completely free! How to create an iPhone ringtone. Play around with the software until you have shortened it down to 30 seconds of your choosing. You can also edit the intro and ending to fade in and out. Once you have finished click File-Export and choose “WAV” from the “save as type” options. ADD: Select the “Audio” icon and select the WAV file you have just saved. 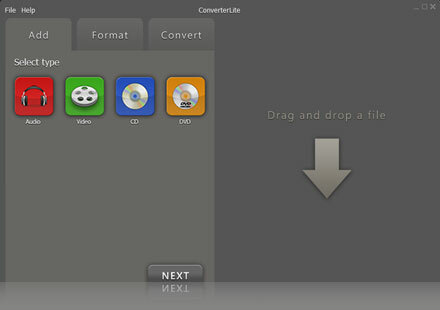 You can also click and drag single or multiple files directly from your folder into Converterlite. When you have chosen your file(s) click next. FORMAT: Your file(s) should be displayed on the right with details on duaration and file type. Displayed on the left are all the output options grouped by “device” or “format”. 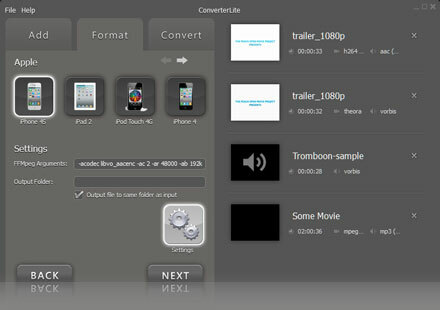 Select M4R from the list of format options, choose a file quality and click next to proceed with conversion. (The converted file(s) will be directed to the same folder as the orignal version however you can choose where to store the converted file(s) by clicking settings, unchecking the output file box and selecting your desired folder). CONVERT: Click convert and once completed you can open up the file location by clicking on the green tick symbol on the right. 6) Click on “Tones” at the top of your iPhone sync screen, and check the box to sync your tones. You can either sync all ringtones in your Tones library or just selected ones.